Life as a cosmetics mule in H.K. Every six months or so, whenever I return to my family home in Tianjin, China, from Hong Kong where I now live, I cross the airport customs surreptitiously with all sorts of intoxicating products stowed in my suitcase. You see, I am a mule. Not a drug mule though, but a cosmetics and skin care mule. Perfumes, creams, powders, lotions. …These are the items that my friends and their relatives, my relatives and their friends, all clamor for. It is the same routine whenever I travel back to China in the past seven years. Once last year, I had to hop from one cosmetics store to another until I visited all the shops on the same floor in a shopping mall before a trip home for the Spring Festival. I “spent” so much I was awarded four bottle of wine, each of which was a gift for 4,000 Hong Kong dollars ($516) in consumption. “Check brand A’s model X, any color, buy if it is lower than HK$20,000; if higher than that, check brand B’s model Y but only in black or blue; buy if it is lower than HK$18,000. Otherwise, go back to brand A”. The moment I finally took over the sealed shopping bag from the sales assistant, the theme song of the Nintendo computer game Super Mario Bros trilled in my mind, celebrating the accomplishment of the task. At this time of writing, a pot of cream, a tote bag and two make-up sets are already packed in my suitcase -- even though I have not scheduled any visits home yet. My experience indicates that for all the recent talk about how mainland tourists’ big spending in Hong Kong has slowed, their enthusiasm for shopping in the city, especially for items such as fashion or cosmetics, is unlikely to significantly fade any time soon. 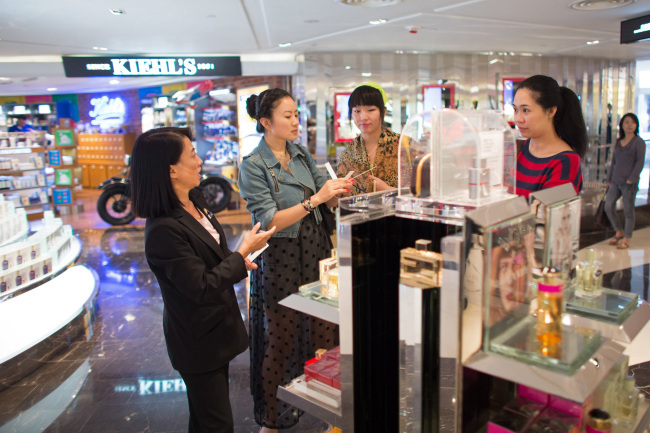 Latest figures from the government showed that total retail sales in June decreased by 6.9 per cent year on year to HK$37.1 billion while the value of sales of jewelry, watches, clocks and valuable gifts plummeted 28.2 percent compared to the same period last year. Industry players have put it down to reasons ranging from the corruption crackdown in China, to mainlanders feeling rebuffed by unfriendly Hong Kongers. Recently, both the central government and the Hong Kong government have also been studying the possibility of scaling down the numbers of individual mainland tourists, given persistent complaints from locals about how they are sweeping goods off the shelves, clogging up public transport and occupying popular leisure spots. Some people suggest a cap on the numbers of mainland travelers each day while others are raising the possibility of limiting Shenzhen residents’ visits a year to 52 (they are allowed to make unlimited trips now). For now though, I’m betting on continuing hordes of mainland tourists heading south. Why? First, shopping is much cheaper in Hong Kong. Take a 50 ml bottle of Chanel perfume. It costs about HK$700 in Hong Kong, while on the mainland, the price is almost double, at 1,100 yuan, or around HK$1,380. High tax burden is one of the main contributors to the difference. The average import duty of cosmetic-related products on the mainland is 11.9 per cent, while that for apparel and bags is 15 percent. Meanwhile, there is an extra consumption tax, ranging from 4 percent to 45 percent depending on the nature of the goods, while another 17 percent in VAT will be added to imported goods. In Hong Kong, the tariff is zero and there is no VAT or consumption tax. At the same time, international brands price themselves higher on the mainland, usually 20 percent to 150 percent higher than that in Hong Kong. This is due to pent-up demand. When mass-market brands such as Zara or H&M opened their first mainland stores, in Shanghai, in 2006 and 2007 respectively, mainlanders formed long lines and snapped up items, in the belief that they are buying into world’s high-end fashion. Third and most important, until mainland China gets its act regarding quality control together, mainlanders will always prefer to make their purchases in Hong Kong -- even if they are buying the same items from the same imported brand. This is a pervasive view among mainlanders -- including my cousin. Like a typhoon swept into town, she barreled through kids’ shop after kids’ shop during a visit two years ago. In the end, she had to buy a 26-inch suitcase, which together with her existing 30-inch suitcase and a backpack, were filled with clothes ranging from summer dresses to winter jackets, baby bottles and toys for her then yet-unborn baby girl. I laughed at her for buying so many items that are labelled “Made in China”, yet she -- in all seriousness -- argued that “made in China and sold in China” is different from “made in China and sold in Hong Kong”. With so many customers like my cousin, I don’t see the trend of mainlanders’ craze for Hong Kong-sold items abating any time soon. Now, excuse me while I go shopping.